When you don’t exist, where are you? 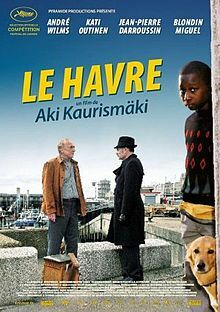 Le Havre, written and directed by Finnish filmmaker Aki Kaurismäki, takes place in the French port town of the title name, where Marcel (André Wilms) lives in the margins of society struggling to make ends meet. Marcel is a shoeshiner who brings home his small earnings to his loving wife Arletty (Kati Outinen) who is, unbeknownst to him, ill. On what appears to be an ordinary day during his lunch break Marcel encounters a young and frightened boy, an illegal immigrant caught in a media frenzy for his capture, named Idrissa (Blondin Miguel). Marcel, poor in funds but rich in heart, assists Idrissa in reuniting him with his family. Director Kaurismäki brilliantly weaves many outsider characters to unite in the effort of doing what’s right in the face of the faceless machines of immigration laws and the misguided media. Kaurismäki does not mask age at all and artistically expresses the characters’ depth and beauty by giving the camera time to take in their essence. Kaurismäki also incorporates the outsider elements subtly, through a song on vinyl (Stateboro Blues) and literature read out loud (Kafka). Perhaps most strikingly captured in Le Havre, is how each person appears to be fully aware and engaged. From the common task of wrapping a package to determining another human being’s fate, all is done with full concentration. Another observation of departing from mainstream is how Kaurismäki plays with time in regards to fashion. From Idrissa’s Cosby-like 80’s sweater, to Atletty’s special yellow 50’s dress to Inspector Monet’s head to toe black clothing with 70’s wide collars, no one is trendy here (thank heavens). Also refreshing and pleasing to the eye is the stunning work of cinematographer Timo Salminen who reveals rich hues and expresses crisp depth perception. The cinematography has a retro-like quality and cohesion to it that can remind one of the continuity of music on vinyl records as opposed to the divisions of digital recordings. The twists and turns of Le Havre are undoubtedly as engaging as getting lost in a new and fascinating city. Kaurismäki turns challenges, like how to raise $3000 Euros quickly for Idrissa’s passage to London, into comical opportunities. The featured ‘trendy charity concert’ is not to be missed. And again it is the not-so-trendy, the otherness, which takes center stage. One may liken this story to a fairy tale, however if it is believed that most people are good at heart then it is rather a reflection of everyday people following their conscience. Le Havre was produced by Finnish company Sputnik Oy with co-producers in France and Germany. The film was award the FIPRESCI prize at the 2011 Cannes Film Festival and is Finland’s foreign language Oscar nominee. Le Havre is featured in the 2011 Vermont International Film Fest.